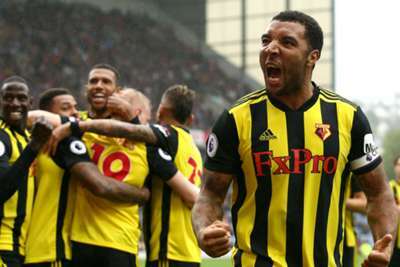 Watford stunned Burnley to register their first away win under Javi Gracia, maintaining their perfect start to the Premier League season in a 3-1 victory. The Hornets, who had previously failed to win any of their last 12 games on the road, struck at the start of either half through Burnley old boy Andre Gray, Troy Deeney and Will Hughes. Burnley appeared in the driving seat after cancelling out Gray's strike - Watford's first away from home since January - through James Tarkowski, but Watford rallied again after the break to devastating effect. Sean Dyche's shell-shocked side were incapable of responding a second time, having played 120 minutes of Europa League football in midweek, and Watford breezed to three points. Watford took just three minutes to end their away goal drought as the influential Deeney centred for Gray to volley home. Yet the lead was short-lived. A strong response from the hosts led to a corner on the right and Ben Foster failed to get anywhere near the delivery, allowing England international Tarkowski to nod down and into the net. Burnley took control and Foster saved smartly from both Johann Berg Gudmundsson and Jeff Hendrick, but Dyche's men were unable to capitalise on their dominance and fell behind again at the start of the second half. A marvellous disguised Abdoulaye Doucoure pass played Deeney in to finish past Joe Hart and Watford did not let up this time, with Hughes pouncing on Matt Lowton's pass and thrashing into the net. Dyche made a series of attacking changes but, although Sam Vokes came close, there was no reprieve. Burnley must hope this is not a sign of things to come as they juggle domestic and European commitments. Getting results in the league is a necessity in order to enjoy the exciting midweek trips. It may well be too early to judge Watford, who were flying at the start of last season, but the end of their away day hoodoo should lead to happier travels. Deeney had already set about disrupting the Burnley defence before teeing up Gray's opener and he remained Watford's chief threat thereafter, working Hart later in the first half and finishing coolly at the start of the second. He is key to the Hornets' success. Burnley right-back Lowton was a threat in the first half, but his error - a desperately sloppy cross-field pass - allowed Hughes to double Watford's lead and all but end any hopes of a comeback. - Watford have won their opening two matches in a top-flight league season for only the second time. On the previous occasion (1982-83), they ended second in the league behind Liverpool. - Burnley are now winless in seven successive Premier League matches (W0 D3 L4) and have an aggregate score of 4-13 in these games. - Three different English players scored in a league match for Watford for the first time since December 31st 2011 (vs Doncaster Rovers). - Andre Gray's opening goal ended a run of 730 minutes without a Premier League away goal for Watford. - Gray's goal by Andre Gray (2:40) was also their quickest-ever in a Premier League away match. - James Tarkowski’s goal was his first-ever strike for Burnley in all competitions, in what was his 67th appearance for the club. If the visits of Istanbul Basaksehir and Watford to Turf Moor in quick succession represented a tricky week for Burnley, tough trips to Olympiacos and Fulham in the next seven days should raise the bar further. Watford are not in action again until Sunday, when they welcome Crystal Palace to Vicarage Road.